No, he's not my dad--but he could be. Or he could be you, someday. I’ve been dealing for over a decade with issues created as my parents aged, including transportation problems. My mother, who’s 90, has vascular dementia that has worsened over the past 12 years and my father is now showing signs of some type of dementia as well. One of the early triggers for recognizing my mom’s dementia was the time she got lost going to a hairdresser who had done her hair for over 25 years, meaning that for over 25 years she had driven the exact same route to the salon. But one day she got lost. She drove around for a while until she found a phone booth (this was over twelve years ago so you could still find a phone booth on a street corner) and called the hairdresser. My dad had to come rescue her. She declined mentally. We moved them into first one assisted living facility, then another that specializes in dementia patients. While Dad didn’t have dementia he had bad hearing that was getting worse and eyesight to match, coupled with impatience and a lead foot. He drove a gold Honda station wagon that sported new scrapes along the sides every time I visited. I told friends to look out if they ever saw a vehicle matching that description, since my dad was increasingly the type of driver who took a stop sign or a speed limit sign as a mere suggestion. My five siblings and I all knew he was going to kill someone eventually and we would have it on our conscience. We tried a strategy of paying a cab driver a nice chunk to be available on call and gave Dad his business card, telling him he had a personal driver at his beck and call. He never called—easiest money that cab driver ever made. The first facility offered van trips to various destinations but as far as I know he almost never took them up on it. Going for a field trip with “a bunch of old people” would not be his idea of a good time. My dad drove like a demon but whenever it came time for a license renewal he studied for the test and drove like an angel—and passed, year after year. And of course, a man who piloted B-17 bombers over Europe certainly wasn’t going to listen to the opinions of his six kids on his driving ability. At first his doctor didn’t want to write a letter expressing concern about his physical ability to drive competently, but we finally got one. That letter; a relationship my older sister fostered with a nice Department of Licensing staffer who one year told Dad that it was the last year he could renew his license; and the step of actually selling the car (since not having a piece of plastic in his wallet certainly wouldn’t stop him) all helped us achieve the impossible: getting him off the road. In his mind, we trapped him. 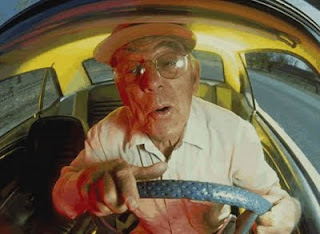 I suggest we all jump ahead a few years and imagine ourselves like my 94-year-old dad–too old to drive safely, but still pretty spry (and more than a little feisty). Do we want modes available that enable us to live in our own homes, independent, for a few more years? When that day comes for you, you may be pretty happy that we invested in completing sidewalks with curb cuts so you can get to the bus stop and get down to the coffee shop to hang out with your buddies and talk about the good old days. You may appreciate a little traffic calming here and there so you can walk across the street–more slowly than you used to–without getting hit by a car. I expect riding my bike to keep me younger longer than my folks (who were pretty robust well into their 80s as it was). When I really need to stop driving, and then riding, transit will still be there for me. My dad unfortunately can’t even imagine taking the bus to get around. Heck, he couldn’t even take advantage of that cab. He has the mindset that driving himself in his own car is the only possible way to get anywhere. I feel sorry for him. By being “independent” about his transportation he has eliminated the independence he could have by choosing transit. It’s a steering wheel in his hand or nothing at all. So it’s nothing at all. How do you plan to maintain your transportation independence as you get older? Bonus question: Are you now humming a certain song by The Beatles? Gotcha! Previous post: Who Really Pays for Streets? We All Do. Next post: We Engineered Ourselves into this Mess. Now We Need to Engineer our Way out of It. “people over age 65 who no longer drive make 15 percent fewer trips to the doctor, 59 percent fewer trips to shop or eat out and 65 percent fewer trips to socialize. Unable to get around, to buy groceries, make medical appointments, visit the bank and so on, boomers will, like it or not, be forced to move into that nursing home.” In other words, giving up a home and a car in suburbia may not seem so bad compared to the alternative. I’m planning riding and walking until I reach this stage, then maybe a trike or makeshift way to keep cycling. The photo was an inspiration! Live in a town where I can walk everywhere. I see people virtually zooming around with their walkers, taking their morning walks regardless of the limitations. Thanks, Kate–what a great pic! I remember being at an event several years ago and meeting a man in his 90s who had biked to it. He didn’t look like he’d be getting off two wheels any time soon, either. So inspiring! Last week I did a 10 mile time trial. The rider in front of (B.James) celebrated his 82nd birthday by completing 10 mile race in 30minutes 23 seconds! I hope I can do that when 82.